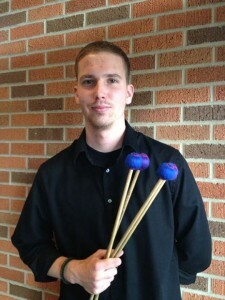 Ethan Gray is a percussionist residing in Reno, Nevada. The art of percussion has taken him through multiple genres and instruments from Japanese marimba to Cuban hand drumming. He has performed professionally for the Billings Symphony in Montana, where he is from, as well as the Reno Philharmonic. He has a keen interest in the exploration of the percussive arts and its natural tendencies of experimentation and was recently commissioned to be the music director for the play Peter and the Starcatcher at Reno Little Theater, a project that required innovation and an unconventional approach to the stage. Ethan is an educator in the local community where he teaches private percussion lessons, the UNR Marching Band, Applied Percussion, and Music Appreciation and regularly spends time at local schools working with young musicians. Ethan holds a Bachelors of Music Performance with a focus on percussion from Montana State University-Billings and a Masters of Music Percussion Performance from University of Nevada Reno. This entry was posted in Drums and Percussion, Piano on January 3, 2018 by Jake Zender.